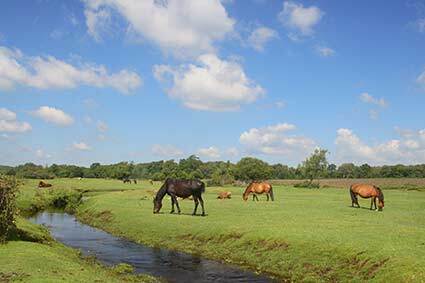 At Longwater Lawn, 2.5 kilometres (1½ miles) from the centre of Lyndhurst, the Beaulieu River passes through a landscape rich in history and wildlife, through tranquil woods and over ancient heaths inhabited by commoners’ stock and deer. The name has been in use for centuries. 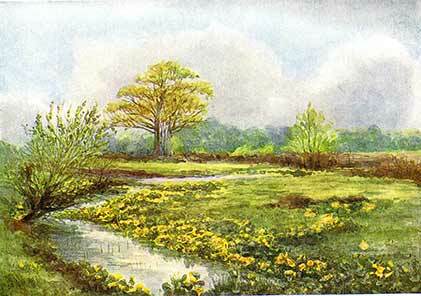 Intersected by the Salt Way, and bordered by Old Ralph Heath, White Moor and Peat Moor; Long Water Lawn is clearly marked on the late-18th century Richardson, King and Driver map of the New Forest. White Moor’s name is also still in current use, but the others have been lost, and so have the names of nearby Keepers Mead, Hoe Beech and Asped Lawn. Keepers Mead can still be seen, however, as a modest stretch of grassland sheltered by adjacent woodlands, shaped exactly as it was when the mapmakers undertook their survey. And Old Ralph Heath still exists, but the identity of Old Ralph remains a mystery. Maybe he was associated with Ashurst Lodge, 1 kilometre (just over ½ mile) to the east. It would be fascinating to know. But by the mapmaker’s time, man had already been present in this landscape for thousands of years, leaving evidence for all to see. Lookout to north and south, on only slightly higher, but presumably drier ground, for Bronze Age barrows, tumuli, the last resting places of warriors or local dignitaries from 2,500, and more, years ago. Notice also another barrow group 1 kilometre (just over ½ mile) east-south-east of Longwater, a group connected by a number of hollow-ways to a circular, 0.8 hectare (almost 2 acres) enclosure a short distance to the north. But although bounded by a prominent bank and ditch, for much of the year this enclosure escapes attention, obscured by dense swards of bracken. The 1870s Ordnance Survey map shows it as a ‘Supposed fort’, although modern maps, more cautiously, simply indicate Earthwork. Experts, however, consider it to be of possible Iron Age date. Longwater Lawn: the name derives from the fertile, natural grasslands bordering the crystal-clear waters of the fledgling Beaulieu River, contrasting sharply with the adjacent, relatively impoverished heathlands. Benefiting from soil-enriching nutrients deposited by every winter flood, the land immediately adjacent to the river has been sufficiently well-fertilised over the years to support this somewhat incongruous growth of grass. Commoners’ stock appreciate the availability of such good grazing, and congregate in large numbers. Fallow, roe and occasional red deer, too, can be seen at dawn and dusk, whilst the short-cropped turf attracts passage wheatears and breeding lapwings to feed. The curlew’s haunting call, too, can be heard in spring, and snipe drum overhead, flinging themselves earthwards from improbable heights whilst hanging out their outer tail feathers to reverberate in the passing breeze. Dragonflies and damselflies grace the spring and summer airways, whilst trout and brook lamprey use the river in which to spawn. The lawn, though, and surrounding area, is surely drier now than formerly, and the river’s nutrients less often spread across the land. Drainage channels, cut probably in Victorian times, bring water quickly off the heath, whilst the presence of long-disused meanders, marooned from the main stream, suggest the work of drainage enthusiasts intent on increasing the availability of grazing land. Well, the marsh marigolds have not been seen for many years, but there is still much to enjoy.